The Greenland Ice Sheet is a mass of ice with an area of 1.7 million km2, averaging more than 2 km thick, and contains enough ice to raise sea levels by 7.4 m. Previously, ice sheets were thought to respond to climate change on scales of 100s to even 10,000s of years. However, in recent years, ice loss from Greenland has accelerated dramatically, from ~0.1 mm/yr in 1993 (~5% of total sea level rise) to nearly 0.85 mm/yr in 2014 (~25% of total sea level rise), and now forms one of the most significant potential contributors to sea level rise in the 21st century. The vast majority (88%) of the Greenland ice sheet is drained by glaciers that flow into the sea. These marine-terminating glaciers are often several kilometers wide and up to a kilometer deep, and their flow speeds can be as high as 40 m per day, which is much faster than the speed of glaciers that terminate on land. As much as 50% of recent ice loss from Greenland is not because of melting, but due to dynamic losses as these marine-terminating glaciers accelerate and increase their rates of iceberg calving into the ocean. Schematic of different kinds of basal drainage and resulting ice responses. In 2013, the UN-established Intergovernmental Panel on Climate Change (IPCC) concluded that the widespread retreat of Greenland marine-terminating glaciers in recent years was a response to their interaction with the ocean. However, observations have since shown that ice-flow acceleration in many cases corresponds with growing surface meltwater production and hydrological pathways to the base of the ice sheet. Today, there is also a growing body of evidence to support a sensitive response when surface meltwater penetrates to the bed of the Greenland ice sheet via fractures and other types of hydrological connections to the bed. Surface velocity across the Greenland Ice Sheet. RESPONDER is exploring the Greenland ice sheet in specific regions where ice-flow dynamics are of particular significance. The field campaigns in RESPONDER are carried out on Store Glacier, which means ‘Big Glacier’ in Danish. The project focuses on this glacier because it has a large drainage basin (35,000 km2), flows rapidly (up to 20 m/day) and discharges large volumes of ice into the ocean (33 million m3 every day). The glacier flows over a deep subglacial trough, which extends 30 km inland from its calving ice front and reaches depths of 1,000 metres below sea level. Such a setting makes the glacier susceptible to fast retreat, which would accelerate ice flow and potentially double present discharge. 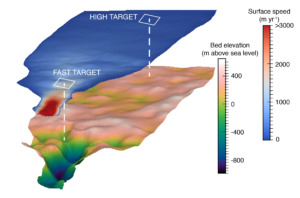 Store Glacier bed and velocity field, showing RESPONDER study sites. The project focuses on two regions of interest on Store Glacier in particular. The first region is where the ice flow rapidly accelerates, thereby facilitating a very effective transfer of ice from the interior of the ice sheet to the coast and ultimately into the ocean as icebergs. 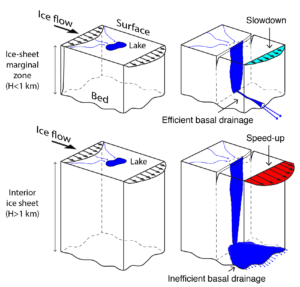 Here, evidence points to an efficient transport of water in large channels, which may make the bed stickier if they can persist despite the very fast pace of ice motion there. The second region is where the bed of the ice sheet was previously cold, frozen and isolated, but is now starting to receive water and energy originating from the surface. This region is important because the evacuation of water in the small cavities that exist there is inefficient, making the bed more slippery. 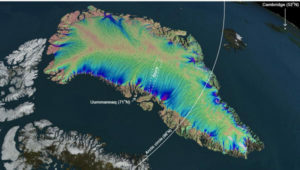 AIM 1 is to identify glaciological ‘hotspots’ and sites for subglacial access drilling and borehole exploration by tracking hydrological pathways beneath Store Glacier, a large marine-terminating glacier in Uummannaq Fjord, using novel geophysical imaging techniques and unmanned aerial vehicles (UAVs), i.e. ‘drones’. AIM 2 is to observe and quantify the hydrological networks of Store Glacier while measuring basal slip and strain within ice with probes and sensors installed in boreholes drilled at ‘coastal’ and ‘interior’ target sites. AIM 3 is to predict the co-evolution of ice flow and hydrological networks in the Store Glacier drainage basin, and assess the vulnerability of the Greenland Ice Sheet as a whole, by integrating field observations in state-of-the-art ice sheet models.